One day I was walking around healthy and happy; the next day I was clinging to my bed with a 104° temperature, crawling back and forth from bedroom to bathroom. I mistakenly thought I could control the high temperatures with over-the-counter medication and foolishly let things go too long. The strep bacteria had found a friendly host in my body and began its invasion. On day three, a friend took me to the doctor for IV fluids and penicillin before the bacteria completely had its way with me. During my illness, I found that all I could do was read. The light from the TV was too harsh, the news too real. I napped and read and stared outside a lot. Once I wished for a week in bed with a good book. Be careful what you wish for. I had started reading Life of Pi the week before, on vacation in Hawaii. I was sitting on a beach one day and a rogue wave came ashore and washed over me, my book and everything. The book survived and I laughed and said that the ocean had kissed my book. That it was the Pacific Ocean was fitting. I didn’t realize it at the time, but that baptism created a bond between me and this strange little novel. A week later back stateside, my relationship with Pi gradually became a surreal experience of life imitating art and vice versa. Yann Martel’s fictional story and my reality became intertwined over time and became one. When I wasn’t sleeping or reading, I found it hard to find the seam of where the story ended and my life picked up. All the usual patterns in my life were broken, day and night were a blur. I even forgot, for a time, that I was a mother. My shifted reality took place in my bedroom, on my bed. While Pi was cast adrift in a lifeboat on the Pacific, with Richard Parker, I was cast adrift on a sea of illness, my bed my lifeboat. One day I looked up from the page I was reading, noticed my cat at the end of the bed and saw Richard Parker. I blinked; was I hallucinating? Suddenly, my domesticated cat became a Royal Bengal tiger sitting calmly at the helm. My dehydration was Pi’s, and his mine. The rolling of the Pacific became the dizzy sensation I felt whenever I tried to stand up and then fell back down, fearful of triggering an onslaught of rolling dry-heaves. If such a thing is possible, I gradually fell in love with Pi, Richard Parker and the green, mysterious and deadly, floating island. My time in bed, fighting the bacterial army that was marching through my body, became a scaled-down version of Pi’s epic journey of survival on the Pacific. The bond deepened during the duration of my illness. I finished reading Life of Pi still in bed and sick, but getting better. As the penicillin was working its magic, and I began to re-enter my life, I finished the book. 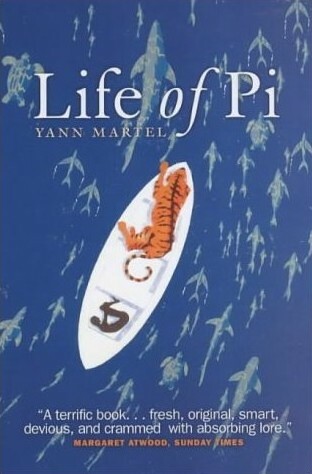 I cried after reading the last page and last sentence because, just as Pi said goodbye to Richard Parker without the tiger’s slightest acknowledgement, I said goodbye to Pi. Richard Parker bounded off into the jungle without even a glance back, and of course Pi did not care a whit about me. After Pi was finally rescued and was being cared for in a Mexican hospital, I understood his depression, his loss. The book’s ending was brilliant, yet I wasn’t quite ready to let it go. At one point in the story, Pi wishes for a book, “My greatest wish — other than salvation — was to have a book. A long book with a never-ending story. One that I could read again and again, with new eyes and fresh understanding each time.” Ironically, his wish was my gift, a book that lifted me, sustained me, and kept me afloat on an unsettled sea. My emotional involvement with this book is unlike anything I’d ever experienced before. I read Gone With the Wind several times as a teenager and became so absorbed in that Civil War saga all I could do was eat, sleep and read — with red-rimmed eyes — for weeks. I was emotionally involved in that story, yet somehow this was different. It was simply a matter of love. I wasn’t in love with Scarlett or Rhett like I had fallen in love with Pi. My week in bed was nothing compared to Pi’s epic journey of survival and of course my journey was real and his wasn’t (or was it?). But somehow the essence of fiction and nonfiction was a shared experience. My illness, it turns out, was one of those transformative illnesses, where my life was inwardly altered. Addictions were broken and attention was shifted to the temple that is my body. Gratitude for good health was renewed, as well as an awareness of how quickly things can change. In the end, my illness turned into a philosophical and spiritual gift, not unlike the thread that ran through Life of Pi. The combination of being so ill and reading this particular book was a recipe for transformation. When a person is changed so remarkably from the mere reading of a book, I call it Grace.